An artist's imaginary version of a dream. Oneirology (/ɒnɪˈrɒlədʒi/; from Greek ὄνειρον, oneiron, "dream"; and -λογία, -logia, "the study of") is the scientific study of dreams. Current research seeks connections between dreaming and current knowledge about how the brain works, as well as understanding of how the brain works during dreaming as pertains to memory formation and mental disorders. The study of oneirology can mean from dream interpretation in that the aim is to quantitatively study the process of dreams instead of analyzing the meaning behind them. Aserinsky, E. and N. Kleitman. 1953. "Regularly Occurring Periods of Eye Motility and Concomitant Phenomena during Sleep." Science 118: 273-274. Dement, W.C. and N. Kleitman. 1957. "The Relation of Eye Movements during Sleep to Dream Activity: An Objective Method for the Study of Dreaming." Journal of Experimental Psychology 53: 339-346. Domhoff, G. William. 2003. The Scientific Study of Dreams. Washington, DC: American Psychological Association. Gackenbach, Jayne and Stephen LaBerge, Eds. 1988. Conscious Mind, Sleeping Brain. New York: Plenum Press. Hadfield, J. A. 1969. Dreams and Nightmares. Middlesex, England: Penguin Books. Hobson, J. Allan. 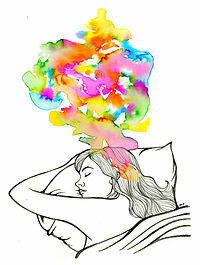 The Dreaming Brain. New York: Basic Books, Inc., Publishers. This page was last changed on 9 December 2017, at 08:37.